South Head looks like an island veiwed from this perspective. 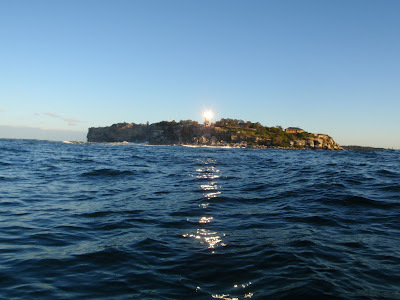 The low angle of the afternoon sun creates a brilliant flash reflecting off the Hornby Lighthouse prism. 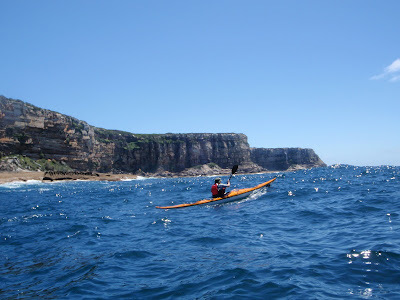 Viv heads North out of the Harbour for her first paddle along these cliffs. Alan checks out Passenger Liner and decides he is happier in his new Explorer. 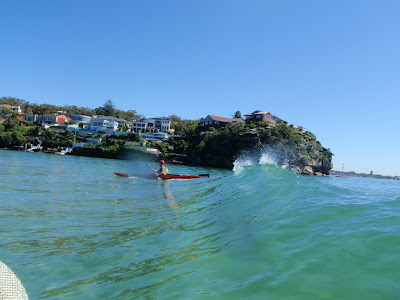 Some of the Tuesday night crew hit the afternoon fizz off North Head. 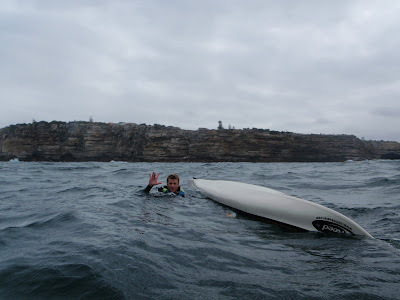 Tony about to catch a ride on one of the friendliest bars in Sydney during a wave riding session at Bundeena. 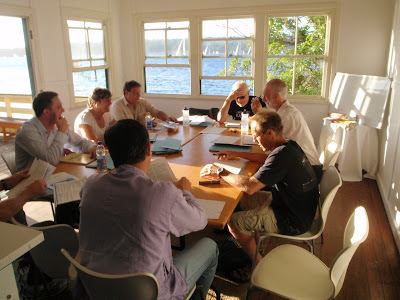 Presenting a Sea Leader course at the Neilsen Park Kiosk. 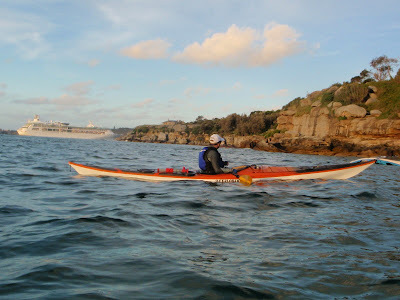 It was hard to compete with the harbour view. 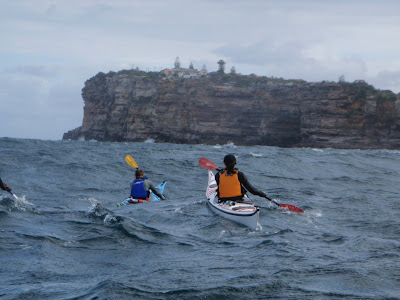 Shaan and Alan plugging into a headwind south of The Gap. It's not as easy as it looks! 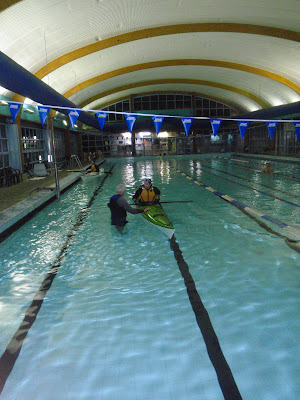 The Water in Sydney Harbour was still 17degrees in late October, so pool rolling became a weekly drawcard. 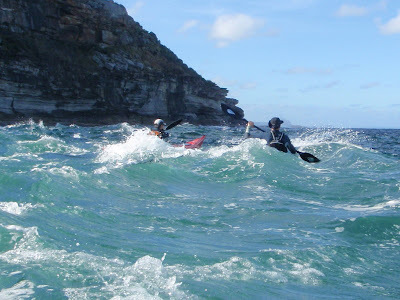 Danny started paddling with us over the past few months. He is a fast learner who doesn't mind falling in at the deep end. 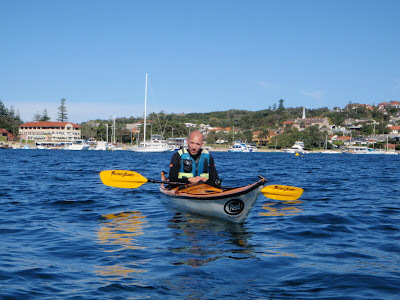 He has his sights set on a kayak crossing of Lake Victoria in Africa: a pretty serious adventure! 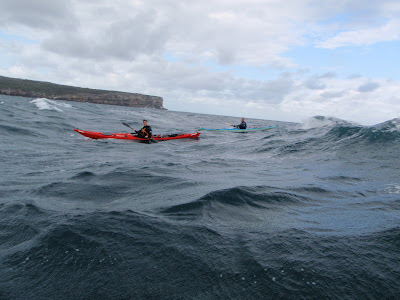 Chris and Ian lining up for a ride back to Sydney Harbour on a fresh southerly breeze. The truly adventurous Andrew Hughes paid Sydney a visit to deliver a fascinating account of his solo coastal expedition along the Papua New Guinea coast. Here he is pictured in my Valley Aquanaut about to do some rolling tuition. We had a great afternoon and I learnt a lot about Andrew's approach to expeditions and in return, Andrew learnt just how much water gets up your nose when you practice rolling without a mask. If you get a chance to see Andrew present his story don't miss it. There seems to be a lot of water in your pictures. Perhaps some variety would be good? Some roads, mountains and trees for those of us not so interested in looking at water.